The digital world has changed how consumers discover and buy manufactured goods. Rather than relying on advertising, your customers now research products online before they buy. Market studies show that 57% of the buyer’s journey has already taken place by the time they approach manufacturers to make a purchase. This has transformed the lead generation process – making effective inbound marketing crucial to any manufacturing company’s success. In the past, marketing your products using outbound techniques was easy. Manufacturers could rely on distributors and retailers for sales, or sell products directly to customers through sales representatives. Back then, a website was just a shop window that advertised what was on offer, generating few, if any, direct sales. But marketing doesn’t work like that anymore. Your customers are looking online for products that can solve their problems. If they find the solution on your website they’re much more likely to buy from your company. In fact, 95% of buyers choose a solution provider that has “provided them with ample content to help navigate through each stage of the buying process.” This is where inbound marketing comes in. Inbound marketing uses interaction rather than interruption to attract target customers. At its heart is digital content (blogs, videos, infographics, emails, social media, white papers etc.) that’s focused on your customers’ needs. It makes the connection between the problems they face every day and the ways your products can help to solve those issues. Manufacturers who use inbound marketing build deeper relationships with their customers. If your marketing content helpfully informs consumers of their options throughout the buying journey, it’s more likely that you will be their chosen seller and that you’ll retain their loyalty for future purchases. 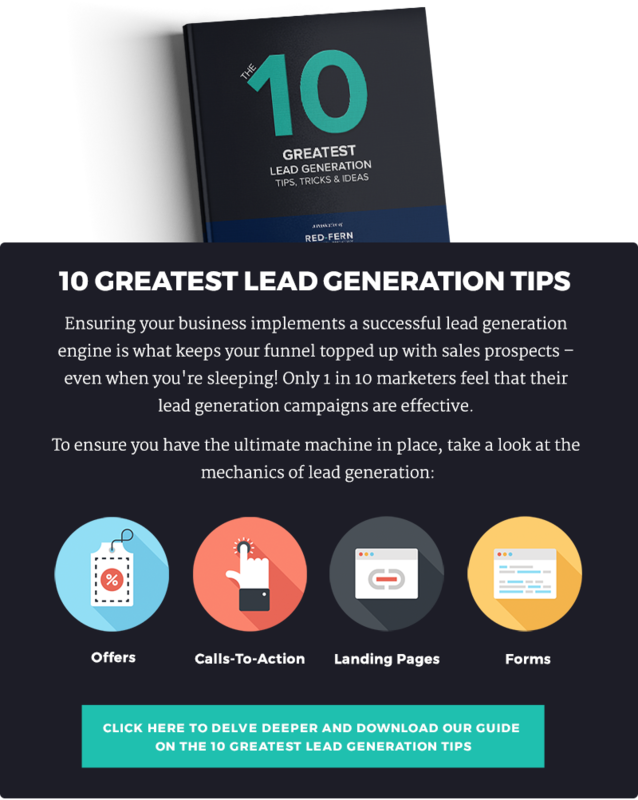 The success of inbound marketing lead generation is based on data gathered at every point of the sales funnel. It provides a rich evidence base that shows how buyers respond to your marketing content, and so is highly effective at growing revenue. As the manufacturing sector moves towards digital production models and Industry 4.0, data-driven inbound marketing is the perfect complement to the trend of using Big Data to shape manufacturing decisions. With its focus on building deeper relationships with your customers, an inbound approach will give your manufacturing company a more holistic view of your markets, enabling strategic decisions that put your end users at the heart of value chains and R&D. When you know what works, you can adapt your sales and marketing strategy accordingly. The data provided from automated marketing software and CRM programs will give you valuable insight into how effectively your digital marketing campaigns are addressing customers’ needs. This information makes it easier for your marketing team to determine which content generates the most leads, and which sources of leads are more likely to convert to sales. With a better understanding of your customer, it's easier to personalise your website design so it suits individual buyer’s needs. When people can find what they need without any fuss, your website’s seamless user experience (UX) will help retain customers and attract new brand advocates. Inbound marketing also saves you time and money. On average inbound costs 60% less per lead than traditional outbound techniques. It shortens the sales cycle too. With just over a third of manufacturing companies adopting digital marketing so far, it’s not hard to see how inbound can give your manufacturing company an edge over the competition. What if my Dream Clients are Professionals or Industry Experts? It's a common misconception that inbound marketing only works if you’re selling products to consumers. Your marketing team might worry that their target audience of professionals or industry experts won’t be interested in your B2B lead generation ideas. But this just isn’t the case. Marketing Blender’s 2016 survey found 80% of B2B decision-makers and buyers prefer to get company information from a series of articles than a traditional advertisement. 84% of CEOs and VPs used social media to make purchasing decisions. If you’re not using inbound marketing, your manufacturing website is missing out on valuable business sales leads. The inbound marketing funnel outlines the three levels of interest your customers’ display when they search your website for product information. To get customers to progress to the next level of interest, your marketing team must provide content that matches this level of interest and makes them curious to find out more. The customer wants to know how to solve a problem, so your content should focus on providing educational information without a heavy sales focus. Create blogs, articles, videos or infographics that provide answers to common questions your customers may have. This is an opportunity to show your company’s expertise, so consider answering questions or providing tips on industry-related subjects. Your customers know what they need to solve their problem, and are now trying to decide whether your brand offers the best solution. At this stage you offer more in-depth content such as longer articles, case studies or trial samples in exchange for contact information. This method is a good source of business sales leads. Follow up and nurture these leads with more relevant, useful information by email. At this stage of the funnel, you have narrowed things down to those people who are ready to buy your products. You might provide more specific information as to why your product is the best on offer, e.g. in a detailed white paper showcasing specific products. You will also provide hyperlinked Calls to Action (CTAs) that drive readers to speak to your sales team, or buy a product direct from your website. (I’ll explain why hyperlinks are so important in the next section). A CTA is the most important part of any digital content you produce. It’s the part of the article, blog, video or infographic that tells your customer what to do next. Without it, people do nothing. CTAs show them the path of least resistance and help them walk it! CTAs positioned at the end of a blog or article contributed only 6% of a post’s total leads. Between 83% and 93% of leads generated from a post come from anchor text CTAs (hyperlinks positioned between paragraphs in the main text, for example) or from internal link CTAs (hyperlinks that offer more information on an aspect of the post). The most effective CTAs are placed on the top right hand corner of a page, where eyes naturally drift as you read a page. Pop up CTAs are only effective if they offer something valuable and interesting to the reader, otherwise they will be ignored. Food for thought for your marketing department. The Role of Social in Inbound Marketing. Social media is an essential aspect of inbound marketing. Sharing your lead generation activities through posts and tweets helps to build brand awareness and drive traffic to your website. This kind of sharing also displays the ‘social proof’ that your products are reliable and trustworthy, making others more likely to endorse and buy them. As well as sharing customer reviews and providing backlinks to your website, social media can boost your brand with a product endorsement from a thought leader in your industry. Your marketing department should proactively try to engage industry leaders in marketing campaigns. Invite these leaders to speak at events you’re organising, or interview them and share the video on social media. Nurtured leads make 47% larger purchases than those who weren’t nurtured. Companies that nurture leads make 50% more sales than non-nurtured leads. If you manufacture B2C products your marketing team will concentrate on more customer-focused social networks, such as Facebook, Instagram, or Pinterest. While B2B manufacturers should focus their marketing lead generation activities on professional networks on LinkedIn and Twitter. Make sure your marketing team has at least one person dedicated to nurturing potential customers via social media. You’ll soon see the results reflected in your bottom line. Pay per click (PPC) and social media advertising campaigns are effective ways to generate more traffic to your content and introduce your products to a wider range of potential customers. Social media platforms enable you to target your advertising to consumers in key locations, demographics and interest groups, making them more valuable than organic internet searches alone. When you use CRM software to analyse the conversion rates from PPC and social media advertising campaigns you can determine which platforms are most effective at generating qualified leads and sales of your products. This makes it easy to focus on the networks where your customers are most likely to be, saving you time and money. Once a potential customer has given you their contact details to access some valuable information on your website, they become a valuable lead. Although they have indicated that they need a product like yours to solve a problem in their life, they may not be ready to buy straight away. By sharing a variety of helpful, relevant content and industry information by email, you can build a positive, helpful relationship of trust with customers over time. It’s a great way to nurture leads, and it keeps your brand top of mind until they are ready to make a purchase. Your inbound content is also important because it makes it easier for customers to find your products online through search engines. Search engines use complex algorithms to work out the relevance of a web page. The more relevant your web page is to a search query, the higher up the search results it will appear. Two key factors that influence this are how relevant your content (what’s written) is to the search query and how much authority it has. Including popular keywords in your digital content denotes relevancy. Shares and links denote authority. So, by creating high-quality content that’s keyword rich and shared across social and via email, perhaps boosted with paid advertising, your articles (and your company) will shoot up the search result listings. It’s a self-fulfilling SEO prophecy. Write great content, use the correct keywords, share where you audience exists and attract visitors. The more visitors and engagement you accrue, the better your search results will be as people perpetuate the share-and-link cycle. This in turn will result in more traffic to your website, and – if your inbound marketing is consistent – more direct sales. Really effective inbound marketing happens when your sales and marketing teams are integrated, working together to share customer insights and qualified leads. Known as ‘Smarketing’ this approach harnesses the strengths of the two departments and gives them the data that enables them to engage prospective customers online. Smarketing can be a very effective way to boost revenue. According to a survey carried out by Hubspot in 2015, combining the two teams boosts marketing revenue by an average of 208%. By now I’m sure you’ll agree that inbound marketing can offer you huge opportunities to streamline your lead generation process, grow your revenue and cut costs.